Patrick Maynard Stuart Blackett, Baron Blackett OM CH PRS (18 November 1897 – 13 July 1974) was an English experimental physicist known for his work on cloud chambers, cosmic rays, and paleomagnetism, winning the Nobel Prize for Physics in 1948. He also made a major contribution in World War II advising on military strategy and developing operational research. His left-wing views saw an outlet in third world development and in influencing policy in the Labour Government of the 1960s. In August 1940 Blackett became scientific adviser to Lieutenant General Sir Frederick Pile, Commander in Chief of Anti-Aircraft Command and thus began the work that resulted in the field of study known as operational research (OR). He was Director of Operational Research with the Admiralty from 1942 to 1945, and his work with E. J. Williams improved the survival odds of convoys, presented counter-intuitive but correct recommendations for the armour-plating of aircraft and achieved many other successes. His aim, he said, was to find numbers on which to base strategy, not gusts of emotion. During the war he criticised the assumptions in Lord Cherwell's dehousing paper and sided with Tizard who argued that fewer resources should go to RAF Bomber Command for the area bombing offensive and more to the other armed forces, as his studies had shown the ineffectiveness of the bombing strategies, as opposed to the importance of fighting of the German U-boats, which were heavily affecting the war effort with their Battle of the Atlantic of merchant ships  In this opinion he chafed against the existing military authority and was cut out of various circles of communications; after the war, the Allied Strategic Bombing Survey proved Blackett correct, however. 1 2 3 Lovell, B. (1975). "Patrick Maynard Stuart Blackett, Baron Blackett, of Chelsea. 18 November 1897-13 July 1974". Biographical Memoirs of Fellows of the Royal Society. 21: 1–0. doi:10.1098/rsbm.1975.0001. ↑ Massey, H. S. W. (September 1974). "Lord Blackett". Physics Today. 27 (9): 69–71. doi:10.1063/1.3128879. ↑ Anderson, D. (2007). "Patrick Blackett: Physicist, Radical, and Chief Architect of the Manchester Computing Phenomenon". IEEE Annals of the History of Computing. 29 (3): 82–85. doi:10.1109/MAHC.2007.44. ↑ Anderson, R. S. (1999). "Patrick Blackett in India: Military consultant and scientific intervenor, 1947-72. Part one". Notes and Records of the Royal Society. 53 (2): 253–210. doi:10.1098/rsnr.1999.0079. ↑ Nye, Mary Jo (2004). "Blackett, Patrick Maynard Stuart, Baron Blackett (1897–1974)". The Oxford Dictionary of National Biography. doi:10.1093/ref:odnb/30822. ↑ Kirby, M. W.; Rosenhead, J. (2011). "Patrick Blackett". Profiles in Operations Research. International Series in Operations Research & Management Science. 147. p. 1. doi:10.1007/978-1-4419-6281-2_1. ISBN 978-1-4419-6280-5. ↑ Lovell, Bernard (1976). P. M. S. Blackett: A Biographical Memoir. John Wright & Sons. pp. 1–3. ISBN 0854030778. ↑ Blackett, P. M. S. (November 1957). "Technology and World Advancement". Bulletin of the Atomic Scientists. 13 (9): 323. ↑ "Hugh Miller Macmillan". Macmillan Memorial Lectures. The Institution of Engineers & Shipbuilders in Scotland Limited. Archived from the original on 3 November 2013. Retrieved 16 July 2014. ↑ Longmate, Norman (1983). The bombers: the RAF offensive against Germany, 1939–1945. Hutchinson. p. 132. ISBN 978-0-09-151580-5. ↑ Hore, Peter (2002). Patrick Blackett: Sailor, Scientist, Socialist. Psychology Press. p. 181. ISBN 978-0-7146-5317-4. ↑ The London Gazette: (Supplement) no. 43667. p. 5496. 12 June 1965. ↑ The London Gazette: no. 44460. p. 12859. 24 November 1967. ↑ The London Gazette: no. 44776. p. 1008. 28 January 1969. ↑ Bullard, Edward (1974). "Patrick Blackett…: An appreciation". Nature. 250 (5465): 370. Bibcode:1974Natur.250..370B. doi:10.1038/250370a0. 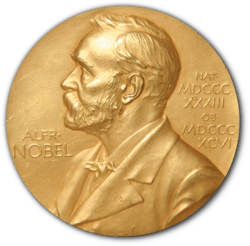 ↑ "Rare double blue plaque award for home of Nobel Prize winners". BBC. Retrieved 28 April 2016. ↑ Nye, M. J. (1999). "A Physicist in the Corridors of Power: P. M. S. Blackett's Opposition to Atomic Weapons Following the War". Physics in Perspective. 1 (2): 136–156. Bibcode:1999PhP.....1..136N. doi:10.1007/s000160050013. .